The Festive Gauntlet Crusher is a Limited Edition Physical weapon. A giant spiked snow boulder sits atop a steep ice slope. Below sits a piece of cheese precisely counterbalanced upon a release trigger. Waiting patiently for some unsuspecting mouse to pick up his last meal! The perfect trap to tempt even the most will hardened of thieves! What good is being sneaky when you're being run down by a giant, spiked snow boulder? Using this trap in the King's Gauntlet can cause extra Gauntlet Potion Tier 3's to drop. 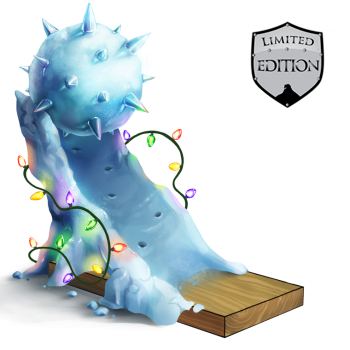 The Festive Gauntlet Crusher was available for purchase from the Festive Ice Fortress Trapsmith for 250 Ice Coins after completing the Ice Fortress during the Great Winter Hunt 2014 event. It could not be refunded. The Festive Gauntlet Crusher acquires a 20% Power Bonus when armed with Snowball Charms. Ancient Gauntlet – Limited Edition weapon causing extra Gauntlet Potion Tier 2 drops. A complete list of all Physical weapons can be found here. 9 December 2014: The Festive Gauntlet Crusher was released at the start of Great Winter Hunt 2014 event. 13 December 2016: The Festive Gauntlet Crusher gained a 20% power bonus when armed with Snowball Charms. This page was last edited on 13 January 2019, at 13:16.